Our worship gatherings are Sunday mornings at 10am! 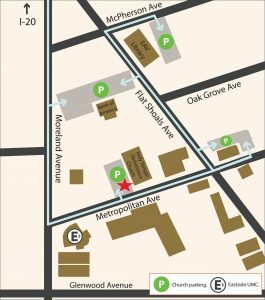 We’re located at 468 Moreland Ave SE, Atlanta, GA 30316 at the corner of Moreland and Metropolitan Ave. We have parking across the street off Metropolitan Ave and there will be Eastside volunteers ready to assist and direct you where to park. You can enter the building through the front doors off Moreland. The doors at the rear of the building through the playground will take you to our coffee bar and Eastside Kid’s Collective wing. The following map will show you where our parking is located (red star). The green lots are open for Eastside attenders. MARTA buses 4, 32 and 74 stop right outside our sanctuary. Wear what is comfortable for you. Some people will wear a suit jacket, others will wear sundresses, and others will wear tattoos, jeans and sandals. Come a 10 minutes early, grab some coffee, hot tea or water and meet some Eastsiders while acclimating yourself to our worship space! Eastside Kids Ministry welcomes children of all ages! Upon arrival, you will be invited to register your children with us and then drop them off with our caregivers and teachers. If you have infants or toddlers, we offer professional childcare during our worship service. If you have older children (ages 3-10), join us for Sunday school. Children in Sunday School are escorted back to join their parents during Passing of the Peace. Read more about our Children’s Ministry here. After you’ve worshiped with us, we would love if you’d fill out our feedback form.